For pounding, driving stakes or whatever, just about any heavy blunt object will do, in most cases. A wooden club or maul is good for this task. 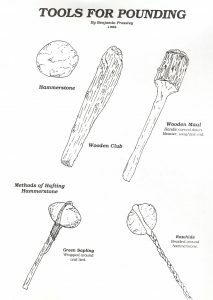 You may find a good, hardwood stick that is already the weight and size needed just laying around or you could take your stone chopper and cut a club to size. You don’t have to cut all the way through, in most cases, just make a groove around it and break it off. A maul is the same as a club except the handle portion is smaller in diameter than the end, to fit in your hand better, while still providing more mass and weight at the end where it is needed. This will take a little more work to do, especially with stone tools. In a survival situation you never want to expend more energy than something is worth, so you may find a club serves you just as well. Hammer stones can be used to work other stones with. They are also good for driving stakes, smashing nuts, etc. and one doesn’t have to be as picky when choosing a rock for these tasks. A heavy stone hafted into a handle can be very useful as a hammer or masher. It is a good idea to make a groove to keep the type of handles we will be discussing from sliding. This can be accomplished by a technique called Pecking. 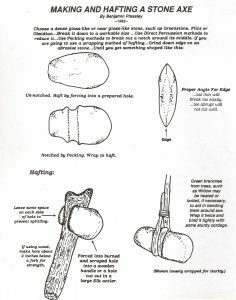 Pecking involves placing the stone you are working on your leg or holding it in your hand and taking a harder stone and striking the rock and removing tiny pieces at a time until a groove is worn all the way around the rock. To haft it, many methods may be used. Rawhide wrapped tightly around the stone and twisted or braided works. A green sapling or limb can be bent around the stone, wrapping it once or twice and then tying it tightly in place. To help the limb bend you may wish to heat or boil it, though you may find it not necessary, for most are fairly flexible. With the axe, one end should be tapered down smaller than the other. It is not grooved but forced into a hole that will hold it with about a 1/16 inch gap around it to keep it from splitting the handle. A large antler, such as elk may be used for this or some heavy wood may be used. If using wood, a thick forked stick is best. Cut off the secondary limbs close and use this end to make the hole in to receive the axe. Also allow about 2 inches above the hole. This is usually a stronger area that resists splitting and producing the hole this far down from the top is further insurance. A wooden handle can be roughed out by chopping and burning. Once this is done you could drill the hole out by various method. 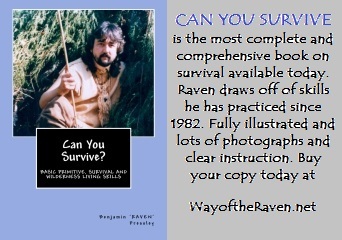 ALL THIS AND MORE IN RAVEN’S GREAT NEW BOOK!